South American plate is a relatively large sized plate located below the continent, South America. 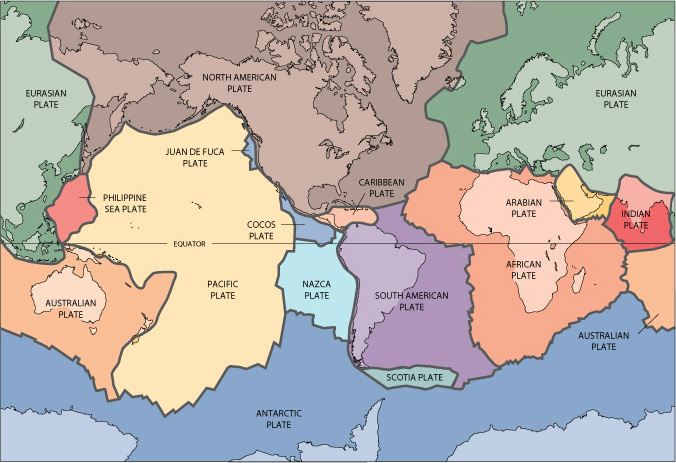 South American plate is bounded by African plate in the east, Nazca plate in the west, Antarctic plate and Scotia plate in the south, and Caribbean plate and North American plate in the north. South American plate is involved in Andes Mountains formation with Nazca plate, and Mid Atlantic Ridge formation with African plate. A supercontinent, Pangea, formed approximately 300 million years ago in the Paleozoic era (Lovett, 2008), and it began to break apart 200 million years ago (Condie 1989). South American plate is one of the plates Pangea broke apart to. Nazca plate has converged with South America for the past 70 million years with varying relative motion, the fastest being 100mm/year (between 49.5 to 42 million years ago, and since 26 million years ago), and at slower times 50-55mm/year. Rapid subduction in northern Andes than the south could have led to greater Andes’ width in Peru and Boliva over Chile and Argentina (Pardo-Casas and Molnar, 1987). There is a sequence composed of four periods of contrasting relative motion starting in Late Triassic that describes the relative motion of South American plate away from North American plate (Ladd, 1975). Tectonic feature of each sequence developed in the Caribbean region; however, a direct cause and effect from only the late Tertiary can be seen in terms of convergent motion of South America and North America, resulting in north south compression across the northern and southern boundaries of the Caribbean (Ladd, 1975). Relative plate motions can be calculated by using global positioning system to the accuracy of 1-2mm/year. The Caribbean plate moves approximately due west relative to South American plate at a rate of 20mm/year (Perez et al., 2001). Spreading rate and spreading direction in the southeast Pacific are increasing (Somoza 1998). Flat slab subduction (slab subducts nearly horizontal) occurs in South American plate and Nazca plates. As a result, 4 Andean Volcanic Belts form (Jordan et al., 1982). They are: Northern Volcanic Zone, Central Volcanic Zone, Southern Volcanic Zone, and Austral Volcanic Zone. Pardo-Casas, Federico, and Peter Molnar. "RELATIVE MOTION OF THE NAZCA (FARALLON) AND SOUTH AMERICAN PLATES SINCE LATE CRETACEOUS TIME." TECTONICS 6, no. 3 (1987): 233-248. Perez, Omar J., Roger Bilham, Rebecca Bendick, Jose R. Velandia, Napoleon Hernandez, Carlos Moncayo, Melvin Hoyer, and Mike Kozuch. 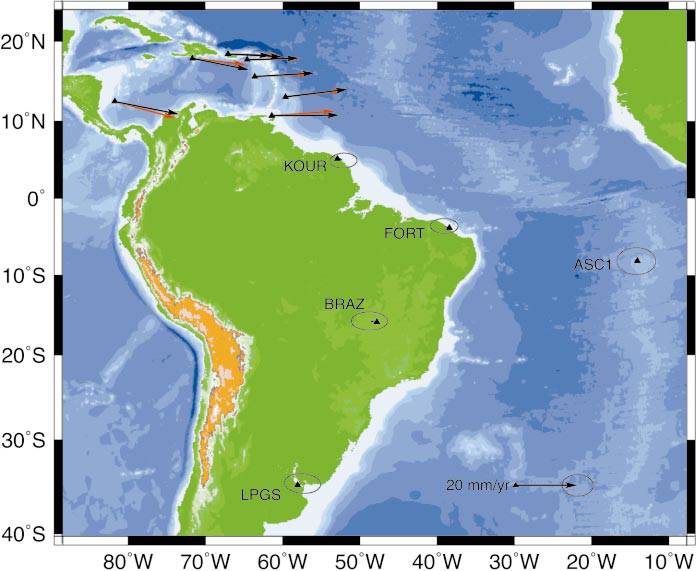 "Velocity field across the southern Caribbean plate boundary and estimates of Caribbean/South-American plate motion using GPS geodesy 1994-2000." GEOPHYSICAL RESEARCH LETTERS 28, no. 15 (2001): 2987-2990. Lovett, Richard A. (September 5, 2008). "Supercontinent Pangaea Pushed, Not Sucked, Into Place”. National Geographic News. Khazaradze, Giorgi, and Jurgen Klotz. "Short and long-term effects of GPS measured crustal deformation rates along the South-Central Andes." JOURNAL OF GEOPHYSICAL RESEARCH 108 (2003): 1-13. 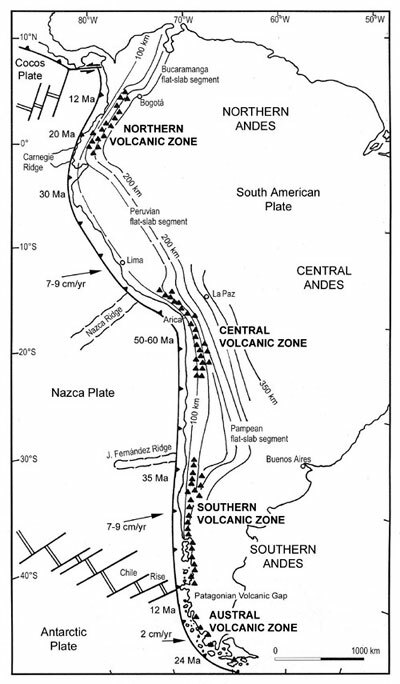 Stern, Charles R. "Active Andean volcanism: its geologic and tectonic setting." Revista Geológica de Chile 31, no. 2 (2004): 161-206.